Years ago, I bought a chest freezer for $100 from a coworker's mother who was downsizing. That chest freezer has saved me much money and given me even more pleasure. When I lived in southern California, I bought whole butchered lambs and pigs from my district's FFA program. I made apricot nectar from my overloaded trees and froze quarts of it. Last year, my friend and I split a goat from his family friend's farm and we stored both his portion and mine in the chest freezer. When I began looking for houses in San Francisco, the chest freezer's placement was something I considered at each open house and viewing. When I saw this house late last spring, I knew exactly where it would go: a garage corner where the freezer wouldn't get in the way of a car or foot traffic. This chest freezer is part of what makes my house my home. 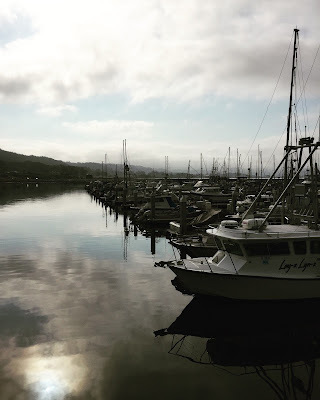 My good friend X recently quit her job at the school where we both have worked and moved away from San Francisco with the goal of strengthening her writing and finding a city in which she felt at home and where she could afford to purchase a house. My house was a landing spot for a few days after her lease ended but before her year of travel began. Her presence added energy to the already happy home. Her poodle chased Indy. X joined me and Scott for dinners and breakfasts at the round oak table, loud with good conversation and laughter. She's traveling now, having already hit the country of Georgia for a month, then returned (landing here again for a day), and set out for a road trip with her dog across the country. I miss her something awful, but I know that when she's back around, this place will be a welcoming port for her. In October, another friend will visit me. My brother and his girlfriend are also coming to stay for a while. Others will be here, too. This fall, this house is filling up. Housing others is part of what makes my house my home. My parents didn't frequently have house guests in the houses in which my brother and I grew up; instead, they had house residents. In various times in various places, we had the following people stay with us for extended periods of time: a Nepalese missionary, a Hungarian couple who was temporarily in the US for work, a Mexican foreign exchange student, an Iraqi torture survivor and refugee, and a down-on-her-luck woman who my mother met at the supermarket. My parents modeled to me that wealth in space meant the responsibility and opportunity to share that space. When I first moved up to the Bay Area, I added FishLine to my phone in order to see what the local fishermen were bringing in so I could shop for fresh, local, sustainably-caught fish. I intended to make a regular habit of this. 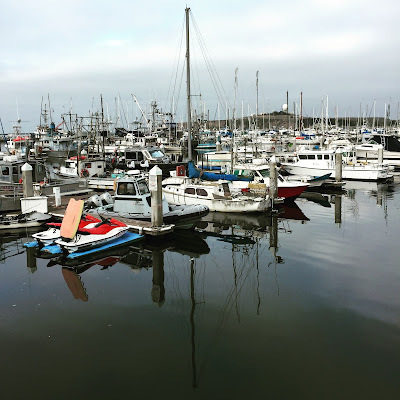 Instead, my habit became checking the app, drooling over what had just come in, but not having the time to drive to Pillar Point Harbor—just above Half Moon Bay—to purchase off the docks. Last week, I changed that. I had a free Friday, the app told me one boat had just come in with King Salmon, so I filled a cooler with ice packs and drove down to buy a fish. When I found the boat in the harbor, no one was on it. The harbor was almost silent except for the foghorn and birds. The water planed like glass. I hung around the boat waiting for someone to show up, and someone eventually did. "You want to buy?" he asked. He used a long pole with a hook to pull out a fish from the boat's huge ice bin. "This is the smallest one I've got. It's about six and a half pounds." "Small is what I want." It was—I had never broken down a whole salmon before and I didn't want to learn on a huge one. I paid cash for the fish, half of what I would have paid for the same weight of filleted fish in the grocery store, took a picture of its shiny eye looking back at me, then placed it in the cooler and drove home. I watched about fifteen how-to videos on YouTube, then dove into filleting the fish. 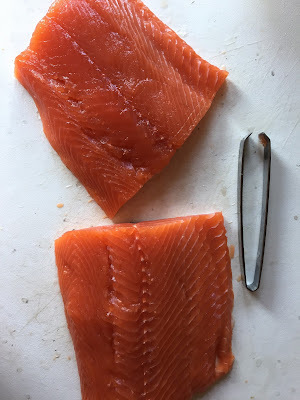 I ended up with six lovely fillet portions, two salmon burgers from scraps, two quarts of rich salmon stock made from bones and head, and a whole lot of sashimi-nibbling while I worked. I vacuum sealed everything we wouldn't eat that night and placed the sealed portions in my chest freezer. That night, Scott and I split a hefty fillet portion. It was rich and buttery, tender and absolutely delicious. Since Friday, I've been checking my app daily. 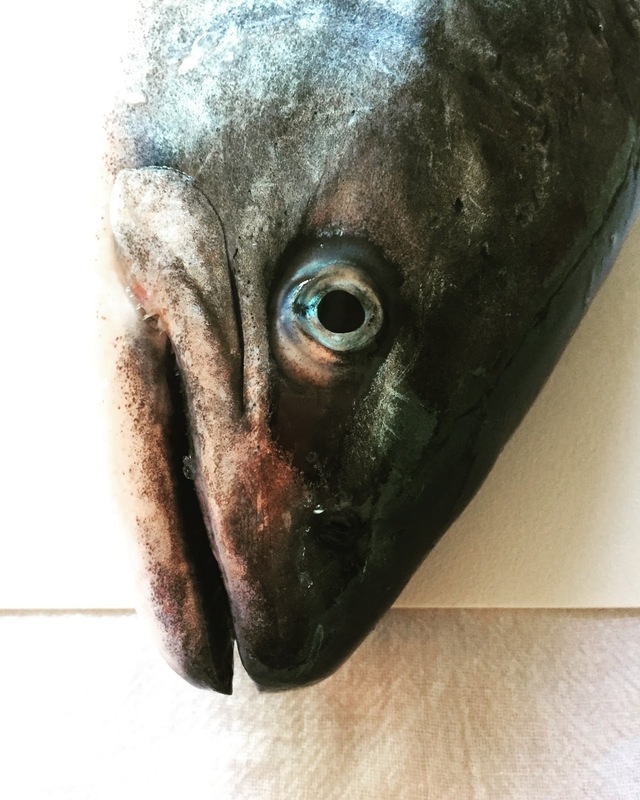 The sablefish are calling me. I haven't had the time to make it back, but I'll return. My chest freezer has plenty of room. It can handle much more. My home has plenty of room, too. I returned Thursday from what was, for me, a mammoth road trip across the northwest, from here to Montana to the San Juan Islands. In central Montana and eastern Washington, grain fields reflect the sun. Light bounces around, ringing through the softly rolling hills of Washington and the mountainous architecture of Montana. In both places, grain elevators mark settlements like church steeples. 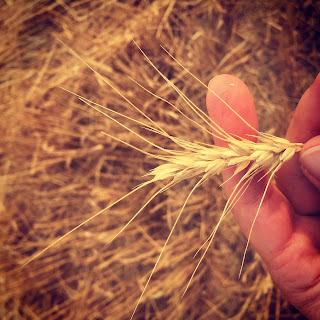 At one stop to stretch my troublesome legs, I picked a ripe just-dried wheat head off a plant. I tore the long tail off the seeds and ate the grains. They tasted like nuts and good bread and sun. It's no wonder that my souvenirs from the trip are bags of different flours and grains. But, there aren't grain fields over the Lolo pass from Montana to Idaho where the Nez Pierce made a famous escape, nor are there many grain fields on Orcas Island where plums and pears grace square orchards and feral apples mark the cedar forests. There are, however, lots of blackberries, just like here in San Francisco and the rest of the Bay. If there's water, there are Himalayan blackberries. This trip was an important, beautiful, and mostly fun trip, but it wasn't an easy one. It was a trip for me and my boyfriend to learn each other's families better. As such, there were the brambly tangles of comforts, joys, and tensions that come with family. There were thorns too. My winding veins took another jab at me and clotted for a second time in my left leg. A show my boyfriend planned to play in Bozeman didn't happen because of the venue's disorganization and poor communication. We had some really sleep-deprived days. On the other hand, there were family feasts, leisurely bike rides, long hikes, swimming with happy kids in bodies of water, all the campfire foods, beautiful sites, and lots of laughs. Once home, I discovered a series of challenges, ones that shouldn't necessarily weigh on me, but collectively have been really hard. I'm still tired, and I guess that has made everything stickier. It took a lot of effort today for me to even take Indy for a walk. We did walk, though. After a stop by a neighborhood block party where Indy let little kids pet his soft ears and only barked once at one of the other dogs, we wound our way back up the hill and into the park. The blackberries are really ripe on a particularly sunny hill, and there are lots of them. 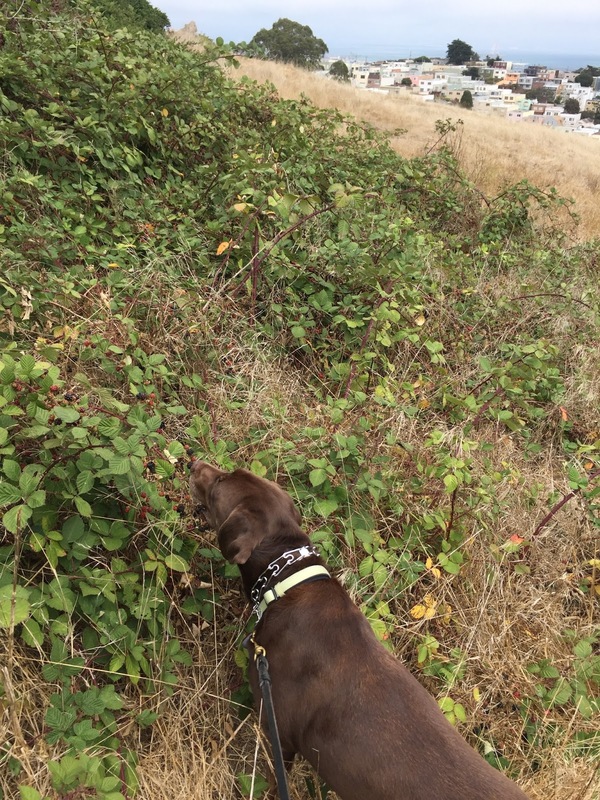 I took out a poop bag—unused, of course—and began to fill it with berries. Indy expertly picked out the low ones. While we picked, a family came by and began harvesting fruit off of a nearby strawberry tree, Arbutus unedo. They talked quietly among themselves as they picked. To me, strawberry tree fruit pales in comparison to blackberries. The fruits are mushy and a little tangy, but mostly bland, no wildness to them at all. Indy, a fruit hound, won't touch them. Yet, the family seemed happy with their mild bounty and Indiana and I were happy with ours. 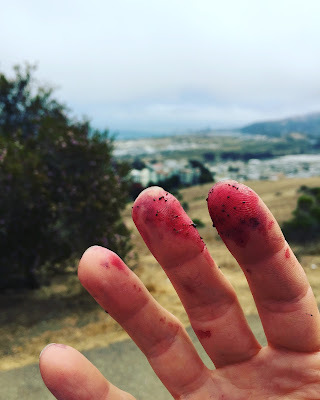 I picked a pound of berries that were so ripe they were practically juice by the time I got home, where I promptly turned them into syrup* to pour over pancakes or vanilla ice cream, or to mix with booze, sparkly water, or both. My fingers are still stained after a couple washings. I have some jabs in my arms. They'll heal quickly though. They won't even scar. The stains and blood are worth it to have the jars of goodness for myself, and more importantly, for those I love. *I use Hank Shaw's easy and delicious blackberry syrup recipe which I modify slightly by adding lime juice to heighten the wild flavor.